Chelby Cinnamen Chezem and Ethan Michael Bridgewater, both of St. Louis, were married Oct. 8, 2016, at The Jewel Box of Forest Park in St. Louis. Ruth Ellen Hasser performed the ceremony. Chelby is the daughter of Jay and Toni Chezem of Jackson. Ethan is the son of Terry and Ellen Bridgewater of Festus, Missouri. The matron of honor was Alana Bey of St. Louis, friend of the bride. 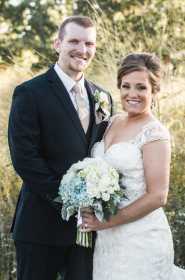 The man of honor was Zach Whelan of Jefferson City, Missouri, cousin of the bride. Bridesmaids were Kelley Breihan of St. Louis, friend of the bride; Michelle Bridgewater of St. Louis, sister-in-law of the groom; and Lauren Bridgewater of Festus, sister of the groom. The ringbearer was Carter Bridgewater, nephew of the bride and groom. The best man was Jon Roth of Arnold, Missouri, friend of the groom. Groomsmen were Bud Lanzone of St. Peters, Missouri, friend of the groom; Zack Bridgewater of St. Louis, brother of the groom; and J.D. Chezem of Jackson, brother of the bride. The wedding reception was held at Andre's West in Fenton, Missouri. The bride received her Bachelor of Science degree in education that included early childhood and elementary education certification from Southeast Missouri State University in 2012. She earned her master's degree in early childnood special education from the University of Missouri - St. Louis in 2014. She is a first-grade teacher at Festus Elementary School. The groom received a Bachelor of Science degree in business administration in 2012 from Southeast Missouri State University. He is a financial adviser at Bridgewater Wealth Management Group in Festus.